Youth Worship is HARD! How fast should we sing the hymns? Are Guitar Solos of the Devil? To many people, especially older folks, the electric guitar solo is the very epitome of everything that is wrong with modern worship music. It is the symbol, the icon of that evil rock ‘n roll that has crept into the church. Why do many of todays modern songs that are on the radio, both “Christian” and “Secular” have guitar solos? What is the point? If a song has the same instrument (human voice) the whole way through, then there is no contrast and it becomes monotonous. An instrumental section gives us time to breathe and think about what we have been singing. In the Psalms, watch for the word “Selah”. We don’t know exactly what it means, but it most likely indicated some kind of instrumental section and a rest from the singing. So as you can see, it is an ancient practice of the church, not some new thing. It is used by both Christian and non-Christian artists. There are emotions, thoughts, expressions that I simply can’t say with my voice. I need a guitar. And others that need to be “said” with a piano… or a violin … or the drums … They each have their own unique voices that communicate in beautiful ways beyond what mere human speech or voice can. Others need to be said with my body. Sometimes I need to close my eyes. Sometimes I need to lift my hands in surrender. Sometimes I need to jump up and down to properly express the joy in my heart. Sometimes I need to weep. Just like we often let an eloquent pastor pray on our behalf, close your eyes and let the instrumental solo pour out to God what you only wish you could express to God. The bias against electric guitar is fascinating. I don’t believe I’ve ever had anyone complain about a solo instrumental piano section. Ever. Or keyboard, drums, … rarely a bass solo, but usually only because the person complaining doesn’t know the difference between an electric bass guitar and a standard electric guitar. Why do electric guitars so often get the “solos” then. Why do the violins, sopranos, tenors, trumpets get more solos than the violas, the bass and alto singers, the trombones, … Some of it is because they most closely resemble the human voice with their capacity to bend, and so many ways the strings can be played because you are touching the strings with your hands for so many nuanced expressions. The sound is often in that same range as the tenor or soprano voice that can really cut through and stick out above everything else. Think of how easily the sound of a single trumpet soloist can rise above the rest of the orchestra. It’s this range and this extreme expressive capacity that makes it the “go to” instrument for instrumental solo sections. 3 Responses to Are Guitar Solos of the Devil? Hey Jason, Thank you for the invite. It looks like fun. Thanks Doug! Great to hear from you! 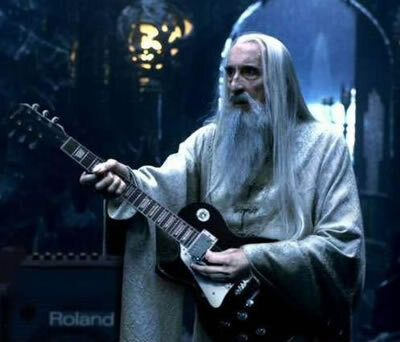 Keep rocking that guitar for Jesus! But the real question is Steve Vai or Jimi Hendrix?